Fr. Kevin Anderson has been the Pastor of Christ Our Light since its beginning in 2010. He comes from a large family being the second of seven children. Fr. Kevin was raised in Elk River, where many of his family members still reside. 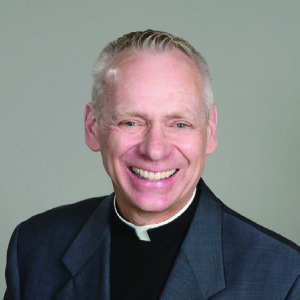 He has served in a number of ministries throughout his priesthood including pastor of the Newman Center which serves St. Cloud State University, Campus Minister at the College of St. Benedict in St. Joseph, High School religion teacher at Cathedral High School in St. Cloud and Associate Pastor of St. Mary’s Cathedral in St. Cloud and of St. Mary’s in Little Falls. Fr. Kevin holds graduate degrees from Loyola University in Chicago and St. John’s School of Theology, Collegeville. He is active in giving retreats and in Men’s Spirituality programs. He is an ardent canoer and camper, and an avid football fan. His special love is singing and playing guitar. He has recorded several CDs, including his most recent one entitled, "One in the Light Christmas."